A recent excellent article by Jason Hammel in conjunction with the annual restaurant discount “rite of passage” in the local newspaper inspired an “aha” moment and the impetus for these musings. I live in the Adirondacks of New York State and like many smaller communities across the country we are hunkering down for the early onslaught of winter and for restaurants – the “off, or shoulder” season (one of many). Just as leaves on the ground serve as a sure sign that winter is on the way, so too are the numerous ads for restaurant discounts. Free this or that, 15% off, two for one, and other random, and desperate price reductions fill the advertising section in our hometown news. Having spent so many years in this restaurant business I look at these with a sense of disbelief and sincere heartache. There are so many challenges that face restaurants today – challenges that the average customer has no knowledge of. Aside from the obvious unpredictability of business volume, there are the growing number of regulations designed to help protect the health and wellbeing of the public, increased cost of utilities, rising food cost, public concern over the integrity of the food supply, exponential increases in rent for restaurant operators (especially in larger urban centers), confusion over the changing face of advertising and promotion brought on by social media, looming challenges driven by an ever-increasing number of competitors, difficulty in finding and retaining good employees, and rising labor costs and associated benefits. Profit margins in restaurants, if operators do everything right, range between 4 and 6%. That’s 4 to 6 cents out of every dollar that customers spend – if they do everything right and control waste and spoilage that are inevitable in food operations. My point here is that restaurants can ill afford to discount prices and give things away. This is a trap that waves a flag stating: “some revenue is better than none”. Marketers may refer to this as “loss leaders”, but in reality it is a sure sign of desperation. Accountants may talk of cash flow being more important than real profit during down times (cash is coming in faster than it is going out), but cash flow gives a false sense of euphoria. Hammel brings up a very strong point in “The Culture of the Kitchen” when he states: “Food you grow for yourself should be cheap. Food made by others shouldn’t be –at any level.” We do spend, as a country, a smaller percentage of our income on food than any other civilized nation; yet there are few things more important to us than the quality food that we consume. Like Hammel, I support raising minimum wage and for that matter all wages for restaurant staff based on their skill set and the requirements of their specific jobs. I also support the provision of some type of reasonable benefit package including healthcare, paid vacations, sick time, and even retirement savings for career cooks, chefs, and service staff, but….and this is a big but – know that this will require a higher rate of return for restaurants. Hammel does address, to some degree, the changing mindset and priorities of a younger foodservice workforce. He refers to a somewhat needier and less committed workforce that does not share the same “all out” dedication to a career in food. Many young people are no longer interested in working the 70-hour weeks that many of us “old timers” saw as the price of admission. Working off the clock, giving up family holidays and working through sickness simply because cooks didn’t want to place undo pressure on their co-workers, appears to be a thing of the past. Additionally, those thousands of culinary school graduates with mortgage size tuition debt are not interested in working their way up anymore – they feel that the degree and its cost entitle them to start at a higher level and demand the salaries that go along with it. From an operational standpoint this simply doesn’t work for restaurants, yet anyone on the outside would certainly understand the employee’s perspective. The restaurant business is labor intensive. One of the most attractive parts of dining out comes from the interaction of customer and staff. 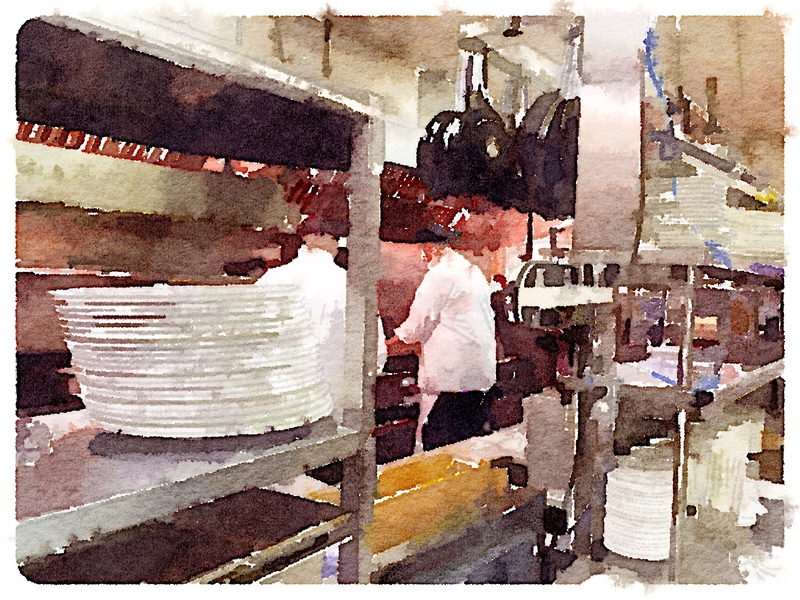 Customers who continue to patronize restaurants in growing numbers (there are over 1 million free-standing restaurants in the U.S. today) love to know that there is a cadre of cooks in the back of the house who painstakingly prepare their food from scratch and that these cooks are all professionally trained and passionate about their work. Americans are fascinated by life in the kitchen as portrayed on television and in countless books on the topic, but fail to comprehend just what it takes for a restaurant to succeed and for those employees to maintain a reasonable lifestyle. There is a disconnect in thought that has yet to be discussed. Restaurants do have choices. I will agree that there are other ways to address the problem of low profitability than simply raising prices. Restaurants can automate certain processes and minimize the cost of labor, they can reduce portion sizes while keeping prices the same, using more convenience items that require less specialized labor is always an option, and buying lower quality raw materials would help, but is this the direction that the industry should take? Quick service restaurants have done a terrific job working with this alternative formula and do provide an opportunity for a segment of the population to lean on the restaurant experience, but we all know the challenges faced in terms of food quality and the impact on the health of our population. Isn’t it time that everyone – the restaurant industry, government, and the consumer begins to look at the cause rather than the effects? Restaurant profitability is the real driver. Profitability is the long-term solution to food quality issues, attracting career professionals to the business, appropriate pay and benefits, and continued growth of one of the most important industries to the American economy. I cringe when I see the off-season ads proclaiming restaurant discounts. The underlying message to the customer is that restaurants must make a boatload of money the rest of the year, so they can afford to cut prices when business is soft. The unspoken message that is the perception of consumers and government is that restaurants do make money hand over fist and should be able to pay their employees a “livable wage”. Well, in fact this is not true. A diminishing labor pool, a workforce less willing to “give it all” to the profession, sub standard wages and a lack of any benefits, as well as food quality and integrity are all effects of the primary cause: restaurants are unable to thrive because of a fearful approach towards pricing. There are a few that have begun to address this issue and charge for maintaining the standards they believe in: Chipotle, Danny Meyer’s Shake Shack, and other larger organizations have opened the door. Now it is time for the smaller private restaurant to take a hard look at how to do the same. This will require all stakeholders to listen, understand, and put their perceptions aside while an industry seeks to find ways to survive and thrive in the future.